PHUKET: Police are currently looking for a gunman who yesterday afternoon (Sept 7) shot a 12-year-old schoolboy in the leg whilst he was still at school taking part in the evening parade. Dang was transferred from the Baan Manik Clinic to Thalang Hospital where doctors removed the bullet from his leg. 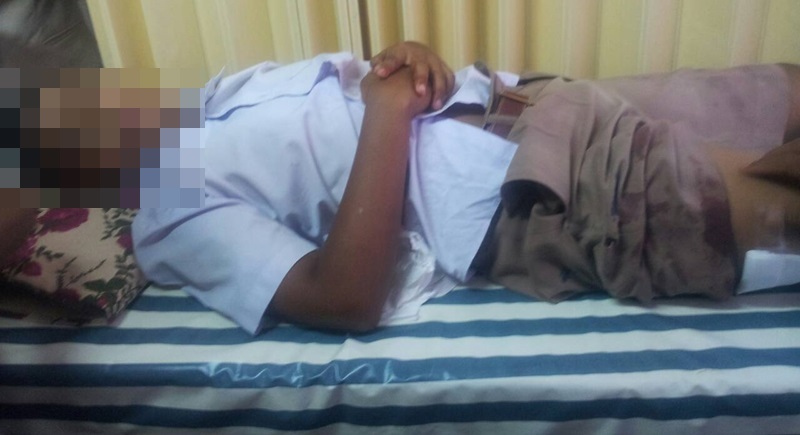 Thalang police received a call from staff at Thalang Hospital at 4:30pm stating they were treating a 12-year-old boy, named as Dang (not real name), from Baan Manik School in Srisoonthon, who had sustained gunshot wounds to his right leg. Police arrived at the emergency room where Dang was being treated and were told that he and his schoolmates were lining up in the courtyard of the school ready to take part in the evening parade before going home. “I felt something hit my leg, and when i looked down I saw blood, then I felt pain,” Dang told officers. Dangʼs classmates alerted their teachers and they took him to the Baan Manik Clinic as it was close to the school. However, Dang had to be transferred to Thalang Hospital where doctors were able to operate and remove the bullet from his leg. Maj Kraisorn Boonprasop from Thalang police said, “Dang said he has never had any problem with anyone. His classmates said he has no enemies or rivals. It is possible that a group of teenagers drove past the school and fired a shot into school for fun or tried to shoot an animal but the bullet struck Dang’s leg instead.